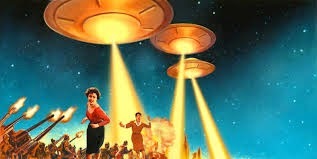 I love science fiction and one of my favorite sub-genres is alien invasion stories. My interest was piqued when I noticed First Contact: X-Corps, a new role playing game based on an alien invasion of Earth over on rpggeek.com. The game has been released in a Spanish and French edition. A free quickstart of the game has been made available in English. I would love to play in a game like this! The game is based on the Open D6 system. This is the set of rules that West End Games used for their Star Wars games. The system only uses six sided dice, the proletariat of the dice community. Some aspects of the system seem fairly simple; role a number of dice, add them up, and compare them to a difficulty number. Some other aspects seem a little more complex, such as the countdown initiative system with interrupted actions. The quickstart rules give you two modes of play. You can be normal people surviving as aliens land, or you can be part of the special ops teams trained to fight the invaders. I like that the character sheets have a section labelled “psychology”, which tells you how your character thinks about things. I was puzzled as to why the paramedic did not have the medicine skill, though. Check out the quickstart here.